It is a real delight to join you to celebrate the Year of the Pig. 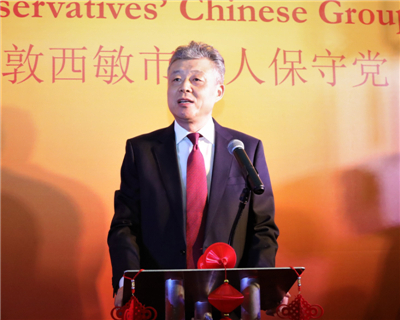 This is the fifth time that I have attended the Chinese New Year Dinner held by the Cities of London and Westminster Conservative Association. In recent days, the Chinese New Year is celebrated across the UK, from the government to the Parliament, from political parties to businesses, and from schools to communities. A few days ago, Number 10 Downing Street was decorated with traditional Chinese couplets and lanterns. Prime Minister May joined members of the Chinese community to celebrate the festival with paper-cutting and “lion eye dotting”. The first leap was the establishment of diplomatic relationship at the level of chargé d’affaires. The second leap was the upgrading to ambassadorial diplomatic ties. The third leap was the signing of the Sino-British Joint Declaration on the Question of Hong Kong. And the fourth leap was the beginning of the China-UK “Golden Era”. Over the past year, China-UK relations have continued to grow. I would like to borrow the capital letter C of the Conservatives Party to summarise the three features of our relations. The first C stands for “cooperation”. China-UK cooperation has yielded fruitful results in trade and investment, financial services, infrastructure development and the Belt and Road Initiative. Bilateral trade was $80.44 billion, exceeding $80 billion for the first time; British export to China reached $23.88 billion, increasing by 6.9% year on year. More than 50 British companies took part in the first China International Import Expo, where over £2 billion of business deals were signed between the two sides. The Agricultural Bank of China and Shanghai Pudong Development Bank set up branches in Britain. 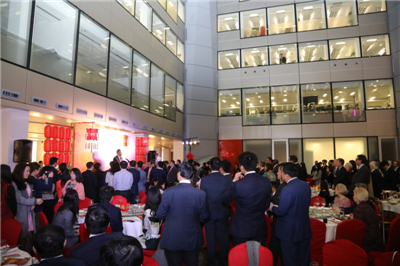 China Re completed its 100% equity acquisition of Chaucer Holdings. This was the largest cross-border acquisition by a Chinese company since 2017. It is also the very first by a re-insurer from China. The All Party Parliamentary Group on the Belt and Road Initiative and China-Pakistan Economic Corridor was set up. China-UK cooperation on the Belt and Road Initiative has gone deeper and become more substantial. The second C stands for the “closeness” of ties between the people of our two countries. As we speak, there are 180,000 Chinese students studying here in Britain, and more than 10,000 British students in China. Over 600 primary and secondary schools in the UK have included the Chinese language in their curriculum. And for the first time, the Chinese language has become the third most popular foreign language in A-level exams. The exhibition “China’s First Emperor and the Terracotta Warriors” hosted by the World Museum of Liverpool attracted more than 600,000 visitors. This has set a record for special exhibitions at the Museum. Eight new direct flights have been launched between our cities. Passenger flight capacity has risen to 150 per week, facilitating more than one and a half million mutual visits every year. More recently, as we ring in the Year of the Pig, Peppa Pig became the most popular cartoon character in China. The third C stands for “coordination” on international affairs. China and the UK have engaged in sound cooperation in international organisations such as the UN, G20 and WTO. We have broad consensus on opposing protectionism and unilateralism and supporting free trade and multilateralism. We have maintained communication and coordination on hotspot issues such as the Iran nuclear issue, the Korean Peninsula nuclear issue and Syria. As we say goodbye to the old year, we should get ready for the new year. In 2019, China will celebrate the 70th anniversary of the founding of the People’s Republic; China and the UK will celebrate the 65th anniversary of the establishment of diplomatic relationship at the level of chargé d’affaires. Looking ahead, I have three hopes for China-UK relations in the new year. And, I am going to again use three C’s to share my hopes with you. First, I hope for “confidence” between our two countries. and enhance strategic mutual trust. With these, we can ensure that the building of China-UK relations stands tall and strong. Second, I hope for “constructive” partnership. The world economy is under downward pressure, with surging protectionism and unilateralism making things doubly difficult. Against this situation, it is all the more important that China and the UK advocate free trade, oppose protectionism and promote open cooperation. We should maximize the synergy between our development strategies. We should explore deeper cooperation in new areas such as artificial intelligence, clean energy, digital economy and the Belt and Road Initiative. We should work together to promote an open world economy. In a couple of months, China will host the second Belt and Road Forum for International Cooperation. Later in the year, the second China International Import Expo will take place. I look forward to a strong representation from Britain at these events. At the same time, we hope that the UK would continue to provide a fair, transparent and non-discriminatory business environment for Chinese companies. We hope you will make successful Chinese companies such as Huawei feel welcome here in Britain, and convince them that the UK is a trustworthy place to put their money. Third, I hope for “cordial” bond between our people. Both China and the UK are known for their profound cultural heritage and important contribution to the progress of human civilisation. I hope that in the new year our two countries will continue to enhance cultural and people-to-people exchanges, and deepen mutual understanding and strengthen friendship. and set a good example of harmonious coexistence of different civilisations. In China, pig is traditionally regarded as the most important of the six domesticated animals. The Year of the Pig often foretells good weather and bumper harvest. I hope that, in this auspicious year, people from all walks of life in both our two countries will join hands to cement the foundation for a solid and magnificent edifice of China-UK relations! In conclusion, I wish you and your family a happy, healthy and prosperous Year of the Pig!